Kremlin spokesman Dmitry Peskov has denied Turkish media reports alleging that Moscow and Ankara have reached an agreement on suspending flights near the Syrian-Turkish border. At the present time, all contacts between Russian and Turkish military officials have been suspended, and a hotline that was established specifically to prevent incidents has been deactivated now, Peskov said in a televised interview shown in a Saturday news program hosted by Sergei Brilyov. "This [the Turkish media reports] absolutely differs from reality. We heard our General Staff's and Defense Ministry's statements yesterday on suspending all contacts on the military level with the Republic of Turkey. Hence, the hotline, which was set up specifically to prevent dangerous incidents, has been deactivated," he said. 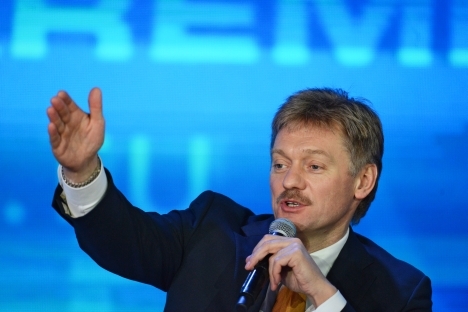 Peskov also said that the Russian pilots acting in Syria are guaranteed against any new hostile actions against them. "One thing can be stated: Russian pilots are guaranteed in case of new danger, and the necessary air defense system has been installed," Peskov said. A Russian Sukhoi Su-24 bomber recently shot down by the Turkish Air Force did not cross Turkey's border, Peskov also said. Asked by the journalist whether the Turkish maps showing the route of the intercepted Russian plane were nothing more than "animation," Peskov replied, "Yes." "You and we have seen an electronic trace showing the plane's route, which clearly proves that there was no incursion into Turkish airspace, whether intended or unintended," Peskov said. The Kremlin does not understand the motives behind Turkey's decision to shoot down a Russian Sukhoi Su-24 aircraft while on a mission in Syria. "It was clear all along that this would be viewed as a horrible provocation. Certainly, they [Turkey's actions] were not in the interests of either NATO, or Russia, or, for that matter, Turkey itself," Peskov said in an interview with TV host Sergei Brilyov. Asked by the journalist why Turkish President Recep Tayyip Erdogan "let NATO down" this way, Peskov replied, "This is the biggest question." "You know, we are receiving a lot of signals from, let's put it this way, various Turkish non-governmental organizations. Like, for instance, the Turkish business association, which is working here and which is literally sounding the tocsin," he said. "They are sounding the tocsin, and they themselves can't find an answer to this question - why did Erdogan do this?" Peskov said.